“I’d sit across the table from senior people in franchisors who’d say ‘I’m surprised, I don’t know why this has happened’. That’s the key driver of Australia’s low wages growth right there: the systemic rorting of Australia’s visa system, often by migrants themselves, which is undercutting local workers’ bargaining power, pay and conditions. The problem was laid-out in all their hideous glory by the book, The Wages Crisis in Australia, released by a group of academics last week. Chapters 13 and 14 dealt specifically with the great Australian migrant wage rort, which is unambiguously lowering employment standards and undercutting local workers. Decisions by the federal Coalition government under John Howard to introduce easier pathways to permanent residency for temporary visa holders, especially international students and temporary skilled workers, gave a major impetus to TMW visa programmes. TSMIT’s protective ability is only as strong as the level at which it is set. In its original iteration back in 2009, it was set at A$45 220. This level was determined by reference to average weekly earnings for Australians, with the intention that TSMIT would be pegged to this because the Australian government considered it ‘important that TSMIT keep pace with wage growth across the Australian labour market’. This indexation occurred like clockwork for five years. But since 1 July 2013, TSMIT has been frozen at a level of A$53 900. .. There is now a gap of more than A$26 000 between the salary floor for temporary skilled migrant workers and annual average salaries for Australian workers. This means that the TSS visa can increasingly be used to employ temporary migrant workers in occupations that attract a far lower salary than that earned by the average Australian worker. This begs the question — is the erosion of TSMIT allowing the TSS visa to morph into a general labour supply visa rather than a visa restricted to filling labour market gaps in skilled, high-wage occupations?.. But why would employers go to all the effort of hiring a temporary migrant worker on a TSS visa over an Australian worker? 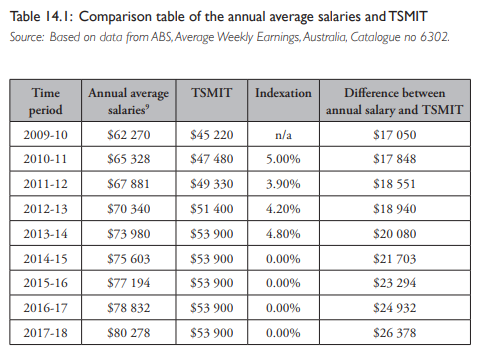 Combined, then, with the problems with enforcement and compliance, it is not hard to conclude that the failure to index TSMIT is contributing to a wages crisis for skilled temporary migrant workers… So the failure to index the salary floor for skilled migrant workers is likely to affect wages growth for these workers, as well as to have broader implications for all workers in the Australian labour market. For years we have seen Dominos, Caltex, 7-Eleven, Woolworths and many other fast food franchises busted for rorting migrant labour. The issue culminated in 2016 when the Senate Education and Employment References Committee released a scathing report entitled A National Disgrace: The Exploitation of Temporary Work Visa Holders, which documented systemic abuses of Australia’s temporary visa system for foreign workers. Mid last year, ABC’s 7.30 Report ran a disturbing expose on the modern day slavery occurring across Australia. Meanwhile, Fair Work Ombudsman (FWO), Natalie James, told Fairfax in August last year that people on visas continue to be exploited at an alarming rate, particularly those with limited English-language skills. It was also revealed that foreign workers are involved in more than three-quarters of legal cases initiated by the FWO against unscrupulous employers. Then The ABC reported that Australia’s horticulture industry is at the centre of yet another migrant slave scandal, according to an Australian Parliamentary Inquiry into the issue. The same Parliamentary Inquiry was told by an undercover Malaysian journalist that foreign workers in Victoria were “brainwashed” and trapped in debt to keep them on farms. A recent UNSW Sydney and UTS survey painted the most damning picture of all, reporting that wages theft is endemic among international students, backpackers and other temporary migrants. A few months ago, Fair Work warned that most of Western Sydney had become a virtual special economic zone in which two-thirds of businesses were underpaying workers, with the worst offenders being high-migrant areas. Dr Bob Birrell from the Australian Population Research Institute latest report, based on 2016 Census data, revealed that most recently arrived skilled migrants (i.e. arrived between 2011 and 2016) cannot find professional jobs, with only 24% of skilled migrants from Non-English-Speaking-Countries (who comprise 84% of the total skilled migrant intake) employed as professionals as of 2016, compared with 50% of skilled migrants from Main English-Speaking-Countries and 58% of the same aged Australian-born graduates. These results accord with a recent survey from the Bankwest Curtin Economics Centre, which found that 53% of skilled migrants in Western Australia said they are working in lower skilled jobs than before they arrived, with underemployment also rife. The Australian Bureau of Statistics (ABS) latest Characteristics of Recent Migrants report, revealed that migrants have generally worse labour market outcomes than the Australian born population, with recent migrants and temporary residents having an unemployment rate of 7.4% versus 5.4% for the Australian born population, and lower labour force participation (69.8%) than the Australian born population (70.2%). ABC Radio recently highlighted the absurdity of Australia’s ‘skilled’ migration program in which skilled migrants have grown increasingly frustrated at not being able to gain work in Australia despite leaving their homelands to fill so-called ‘skills shortages’. As a result, they are now demanding that taxpayers provide government-sponsored internships to help skilled migrants gain local experience, and a chance to work in their chosen field. In early 2018 the senate launched the”The operation and effectiveness of the Franchising Code of Conduct” owing in part to systematic abuse of migrant labour. Then there is new research from the University of Sydney documenting the complete corruption of the temporary visas system, and arguing that Australia running a “de-facto low-skilled immigration policy” (also discussed here at the ABC). In late June the government released new laws to combat modern slavery which, bizarrely, imposed zero punishment for enslaving coolies. Over the past few months we’ve witnessed widespread visa rorting across cafes and restaurants, including among high end establishments like the Rockpool Group. Alan Fels, head of the Migrant Workers Taskforce, revealed that international students are systematically exploited particularly by bosses of the same ethnicity. The problem of low wages growth won’t be solved until the avenue for cheap foreign labour is closed-off via restricting immigration – both temporary and permanent. Think about it from an employer’s perspective: why would you grant a pay rise when you can easily replace a local worker with a migrant willing to work for less? You wouldn’t. Nor would you bother to train-up a local. Let’s also not forget that ordinary workers’ cost of living would be reduced by lowering immigration, for example via cheaper housing (both prices and rents) and infrastructure, not to mention sinking the Australian dollar, thereby making trade exposed industries more competitive. In fact, few other policies would do more to safeguard ordinary workers’ living standards than restoring integrity to Australia’s bloated temporary and permanent visa system. The on air talent and staff at ABC radio in Melbourne recently boycotted a local cafe that they previously frequented because they found out the workers there were being underpaid. These same radio broadcasters champion mass immigration at every oppurtunity. Recently when told SAP wanted to reduce immigration to 70k Jon Faine said “why 70k? Why not increase it to 500k?” Ironic and moronic.